India’s Supreme Court ordered police on Wednesday to put five prominent rights campaigners suspected of links to Maoist guerrillas under house arrest as outrage grew over their detention. 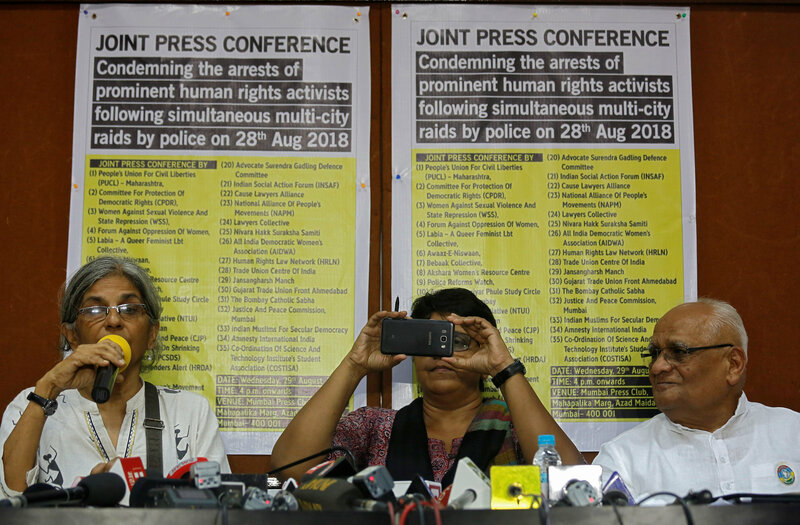 Critics of Prime Minister Narendra Modi’s government have dismissed the allegations against the activists, who were detained a day earlier, and said the crackdown was part of ongoing attempts to stifle all dissent. Police detained the campaigners, seized their laptops and mobile phones, in raids on their homes in different cities, triggering protests and a petition in the Supreme Court challenging the action. Sudha Bharadwaj, who has been fighting for the rights of workers in parts of India such as Chhattisgarh where left-wing guerrilla groups operate, said the action against her was part of a broader crackdown on opponents of the government. “The effort is whatever is the opposition to this regime, whether it is workers rights, tribal rights, everybody who in the opposition is being rounded up,” she told reporters outside her home in Faridabad, a short distance from New Delhi. The arrests follow months of tensions between right wing nationalist groups and advocates of free speech that has played out in college campuses and spilled over into the streets. Critics also say several top journalists have been forced out of their jobs for their critical reporting of the government. The others detained on Tuesday included were Varavara Rao, a prominent poet from the southern city of Hyderabad, activists Vernon Gonsalves and Arun Ferreira from Mumbai and civil liberties activist Gautam Navlakha from New Delhi. Modi’s Hindu nationalist Bharatiya Janata Party-led government has faced mounting criticism from activists and academics, who accuse it of undermining the secular and pluralistic principles of India’s constitution. The BJP denies these allegations but says it is opposed to appeasement of any community and has long advocated tough action to protect national security. “These five are no threat to anyone,” said Prashant Bhushan, a lawyer for a group of leading academics that has petitioned the Supreme Court to release the activists. “The charges against them on the face of it appear indiscriminate, unwarranted, part of a malicious campaign to threaten human rights defenders, independent journalists, writers and thinkers in the country from critiquing the government and its policies, and an attempt to muzzle dissent,” the petition said. Police have also accused the five of inflammatory speeches at a rally in western India last year which led to violent clashes between Dalits, the lowest in the Hindu caste hierarchy, and right wing organisations. A police officer said the main case relates to speeches made during a rally held in the city of Pune on Dec. 31, 2017 commemorating the valour of Dalits. The following day, violent clashes broke out between members of the lower caste and hardline Hindu groups. The police officer, who could not be named because he was not authorised to speak to reporters, said police had seized documents relating to the long-running Maoist insurgency afflicting parts of the country. The guerrillas are fighting for the rights of the landless in parts of eastern and southern India, dubbed “the Red Corridor”. The police officer said the five activists gave intellectual force to an insurgency in which thousands of people have been killed over the years. Modi faces an election next year and opposition parties are trying to forge an alliance to stop his Hindu nationalists from coming back to power. The Supreme Court headed by the Chief Justice Dipak Misra said it would hear the petition challenging the arrests of the activists next week and until then they would be placed under house arrest, and not police custody. Judge D.Y. Chandrachud, one of the judges on the bench, said the right to criticise was a crucial for democracy. “Dissent is the safety valve of democracy. If dissent is disallowed, then the pressure cooker may burst,” he said.